Pictures: Courtesy of various contributors to “Reën in Namibia”, Johann Viljoen, Susan Kruger, Christiaan Jacobie and Hendrik Coetzee. A sudden thundershower over the capital city of Namibia caught those who stayed at home over the holidays unawares at the start of the New Year’s weekend. The sudden down pour was accompanied by hail over the Olympia neighbourhood and in Klein Kuppe storm water gathered in lower lying areas forcing motorists to drive through deep pools of water. 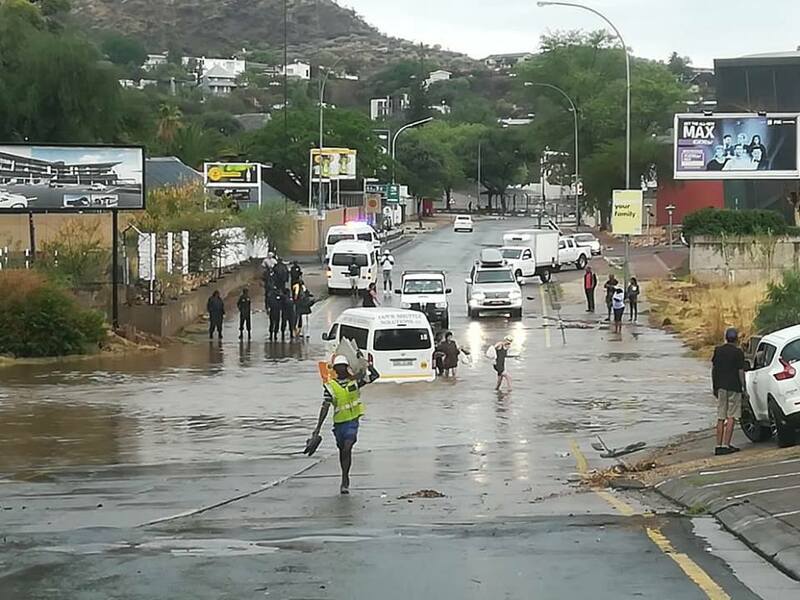 In Klein Windhoek commuters had to cross the raging Klein Windhoek River as storm water also rushed to in lower lying areas. Further south and east of Windhoek in the Elisenheim and Finkenstein estates residents also experienced heavy downpours. 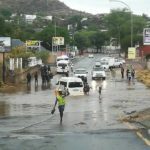 Residents measured between seven and 20 millimeters of rain after the shower that lasted a little more than two hours in certain parts of Windhoek. A quick thundershower also fell over Okahandja and a light shower has been reported in Mariental. A low pressure system over the south eastern part of Angola caused humid air to be drawn from the Indian Ocean over the eastern and southern parts of Southern Africa. The frontal system will lead to some more convergent patches of thunder showers or isolated storms. According to the Namibia Meteorological Service the interior of the country can expect partly cloudy and hot to very hot conditions with isolated to scattered thundershowers over the north, north-east, central and Hardap regions. Windy weather will also prevail over the interior of the country. For the coast partly cloudy and cool to warm conditions with fog patches are predicted.